President Barack Obama’s first trip abroad in his second term took him to Israel and the Palestinian West Bank, where he despondently admitted to those waiting for words of encouragement, “It is a hard slog to work through all of these issues.” Contrast this gloomy assessment with Obama’s optimism on the second day of his first term, when he appointed former Senate Majority Leader George Mitchell as his special envoy for Middle East peace, boldly asserting that his administration would “actively and aggressively seek a lasting peace between Israel and the Palestinians.” How is it that Obama’s active and aggressive search for progress has become mired in the status quo? Writer and political analyst Josh Ruebner charts Obama’s journey from optimism to frustration in the first hard-hitting investigation into why the president failed to make any progress on this critical issue, and how his unwillingness to challenge the Israel lobby has shattered hopes for peace. 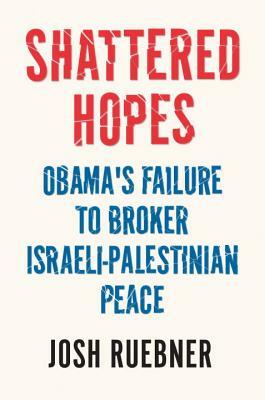 Written in a clear and accessible style by the advocacy director of a national peace organization and former Middle East analyst for the Congressional Research Service, Shattered Hopes offers an informed history of the Obama administration’s policies and maps out a true path forward for the United States to help achieve Israeli-Palestinian peace. Josh Ruebner is the National Advocacy Director of the US Campaign to End the Israeli Occupation. He founded and directed Jews for Peace in Palestine and Israel, which merged with Jewish Voice for Peace. Ruebner was also a former Analyst in Middle East Affairs for the Congressional Research Service, a governmental agency providing members of Congress with policy analysis. He lives in Washington, DC. “This marvelous book looks at one of the thorniest aspects of foreign policy today. It’s a book for those who are not content to sit on the sidelines and watch the continuous dispossession of the Palestinian people, committed if not in our name, then with our blessing.” —Bill Fletcher, Jr.